As we approach the cooling season in Columbus, OH, homeowners throughout the area are thinking about whether they will be able to rely on their air conditioning systems this summer and those to come. Professional installation and repairs are both important to ensuring that your AC works properly. But more importantly, air conditioning maintenance is the key to energy efficiency, performance, and system longevity. Whether your system is 2 or 12 years old, a routine maintenance plan is imperative to peace of mind and home comfort. In this post, we’d like to run through what’s involved with professional maintenance as well as its benefits. 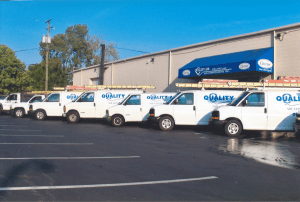 For more information about our professional Columbus, OH air conditioning maintenance service, call the experts at Quality Air Heating and Air Conditioning. Inspection: Your AC technician has to know the status of your system in order to address any potential problems with its operation. Routine maintenance involves looking closely at all system components, including the coils, compressor, air handler, as well as the refrigerant level. Cleaning: This is the most important aspect of maintenance, as I’m sure you know. Even if you are diligent about changing the air filter every month during the cooling season, dust and debris can still accumulate within your indoor and outdoor units, especially when they lay dormant during the heating season. Dirty coils can create inadequate cooling and dehumidification, and cause system imbalances that can increase your energy costs. Repair recommendations: Depending on the type of maintenance plan you enroll in, your technician may be able to address certain issues as part of the maintenance protocols. But, more importantly, he will also recommend solutions to issues that he finds problematic. It’s important to take his advice seriously, because a minor repair today might be a major costly repair tomorrow. Problems do not go away on their own; your AC does not have an immune system. Increased energy efficiency, reduced need for repairs, and excellent system performance are all benefits to enrolling in professional routine maintenance. For more information about air conditioning service in Columbus, OH, call the experts at Quality Air Heating and Air Conditioning today!